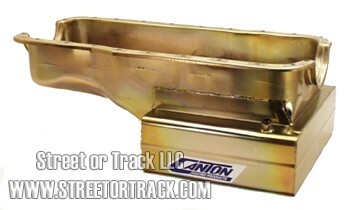 STYLE: Shallow â€œ T â€œ sump Road Race Style Oil Pan. For 289-302 blocks. FEATURES: Track proven diamond shape road race baffle with four trap doors and runners to direct oil to the pickup under all conditions, bolt in slosh tray, temp. fitting, magnetic drain plug, crank scraper and dipstick bung. SIZE: 8" Deep, 13-1/2" Wide front sump with a 9 qt. system capacity. 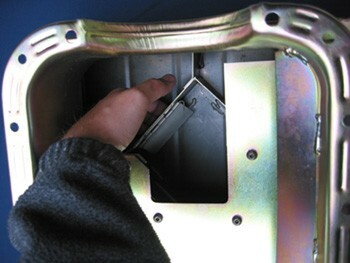 We strongly recommend the use of an Accusump with any wet sump pan used in road race applications.